Part 2: Vintage IC Collecting – The What. Where do I start? Where do I end? Focus! In Part 1 of our three part series on IC collecting we discussed why to collect vintage computer chips. For Part 2 we’ll cover what to collect. which is the most important part of collecting (not just IC’s but anything). Part 1: Why Collect Vintage Chips? Part 2: What Vintage Chips should I Collect? Part 3: How do I collect Vintage IC’s? There are millions of different IC’s made since the dawn of the IC in the 1950’s, obviously it would not be prudent to try to attempt to collect all of them, so one needs to set a focus for their collection. The earlier this is done, the easier collecting will be, and the less chance of going insane, broke, or both. The CPU Shack, as the name implies, began collecting just CPU’s, the brains of computers. Through the years (and due to things being donated to the museum) this has expanded to microcontrollers, SoCs. UV-EPROMs. GPU’s, and even the occasional DSP. It’s a broader slice of IC’s then most would want to attemp, at least when starting. So let’s figure out ways to gain a focus in collecting. NEC B2901AD – Just based on this single chip, one could collect: White ceramics, Bit Slice processors, 2nd sources, NEC processors…. Often the WHAT you collect is related to the WHY. You may be collecting because of a computer system you worked with in your past, or a company you worked for, or even solely based on the first chip you recovered from a scrapped system. 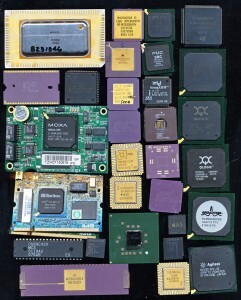 If you want to collect just processors, it may be good to narrow it to a type (PC processors, x86) or a brand. Many people collect only Intel processors, due to their involvement in the beginning of the PC era. This is a good example as it allows for a lot of variety, even keeping with a single brand. Here you can see the progression, from a fairly broad focus, to a very specific focus, even within a single (albeit huge) brand. It is best to choose a category near the bottom of the list, and if you wish to expand, work your way up. This gives an achievable goal, yet still leaves room to expand. You can make the limits very strict, or allow room for ‘eye candy’ you may like, that doesn’t necessarily fit your focus, but it is best to limit this (in terms of money, space, or numbers of chips). Let’s work through another example of WHAT to collect that ISN’T CPU’s but nonetheless could be interesting. If you started at #5 on the list, it gives you a fairly attainable goal to achieve, with a lot of interesting history, pretty packages, and diversity (from a simple quad-NAND up to a full blown ALU). Once you have achieved a significant portion of that set, expanding to the next level is a natural expansion, it keeps the focus, but gives you more opportunities. The same logic is seen in other fields of collecting, such as coins. A coin collector may collect US pennies, US coins, US currency, all coins, etc. It’s no different if your hobby is technology based and setting the goals of your collection early on makes them attainable, and the hobby more enjoyable. If it’s not enjoyable, its hard to justify continuing it, and continuing to spend money on it. Maybe you are unsure what you want to collect, or how to set some focus to your collecting, here are some ideas, that I haven’t seen others specifically focus on that could be rewarding (and in no particular order). Really the possibilities are endless, and the examples shows above can easily be more or less focused to meet your budget, in terms of time, money, and space. The next, and last section of the series will cover How to collect, where to find chips, and where to put them. This is perhaps the easiest part, but the most fun as well, providing Part 1 and Part 2 have been thoroughly thought through. What do YOU collect? Feel free to post about it in the comments, and maybe WHY you chose it. « Part 1: Vintage IC Collecting – The Why. 4 Responses to Part 2: Vintage IC Collecting – The What. I used to work in an office with MOXA at the first floor… They specialize in serial/network type devices.